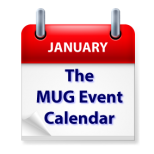 As the holidays fall behind us, The MUG Event Calendar kicks back into gear. Joe Kissell will present digital sharing to an Illinois group, while a Carolina group will listen to iTunes Radio, and a Colorado group will discuss travel apps. Other topics for the week include iOS 8, iCloud, Libre Office, Yosemite, iTunes University and digital photo improvements.